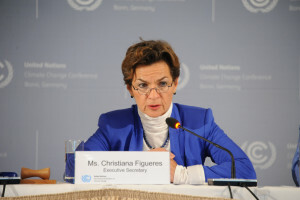 There was a silence, tense and watchful, as Christiana Figueres took the platform at what was hoped to be the final plenary session of the Paris talks on climate, on the night of December 12th. Once that evening already, the UN’s climate chief had taken her seat on stage in the expectation of an announcement that a global agreement could proceed. But, after walking through the packed hall to applause and eager anticipation, the officials from the UN and the French government had retreated, into concerned huddles and a murmuring of disquiet from the hall. Eventually they left the podium and the audience was left to nearly two hours of whispering and rumours that a much-anticipated deal had fallen apart. Would this time be the same? Not for a second time. At close to 8pm, Figueres was on stage with the French hosts of the talks, and they took charge again. After a short pre-amble, the French foreign minister Laurent Fabius, president of the conference, looked ready to announce that an agreement had been reached. But he hesitated slightly, looking to Figueres for guidance. She had no hesitation. “You should bring down the gavel!” she told him. He did, and the Paris agreement was passed. For Figueres, this was the crowning achievement of a lifetime’s work in climate change, environmental protection, and public service. For the world, it was the first time that a legally binding agreement to reduce greenhouse gas emissions in line with scientific advice had been signed by all of the world’s nations, developed and developing alike, requiring governments to limit global warming to no more than 2degC – regarded as the limit of safety – and to try to reduce warming even further than that. In the jubilation that followed, Figueres in a flowing blue-green scarf embraced the French climate negotiator Laurence Tubiana – a key figure in the talks, who had suffered a ruptured appendix just days before the beginning of the crucial two-week long summit – as well as Ban Ki-moon, UN secretary-general, the French president Francois Hollande, and the other VIPs and UN officials on the platform. The hall had erupted into cheering, with dignitaries such as former US vice-president Al Gore and the UK’s Lord Stern, former World Bank chief economist, leading from the front row. Yet only a few months before those final negotiating hours, any prediction that the world’s governments would come to such an accord would have seemed wildly optimistic. The last time countries tried to reach a common global approach to greenhouse gas emissions, the summit collapsed into chaos. That was in Copenhagen, in 2009, when world leaders met to thrash out a deal but were unable to finalise a legally binding treaty. Copenhagen was widely derided as a failure, as a result. Figueres was at Copenhagen. She has been closely involved in climate negotiations since 1995, when she began to take part in the negotiations – which have been going on since 1992 – on behalf of the Costa Rican government. Her father – whose photograph hangs in her office – served three times as president of the country, and is credited with achieving a stable democracy. Her brother also served as president, and her mother as the nation’s ambassador to Israel. With an academic background in anthropology, she wanted to use her skills in public service also, and settled on environmental issues after having to tell her children that they would never be able to observe a beautiful Costa Rican species, the golden toad, that had been common in her childhood but that went extinct in her children’s early years. Although derided as a failure, Copenhagen did produce the first international agreement that required both developed and developing countries to limit their greenhouse gas emissions. It was not a legally binding treaty, but it was a commitment signed by all of the world’s major economies. Figueres acknowledges that her efforts to a Paris accord – more than five years in the making – owe much to the Copenhagen deal. “A very successful failure,” she calls the 2009 declaration. But she wanted more, and she understood that an agreement at Paris was the last chance for the agonisingly slow two-decade-long process of the United Nations to pass such an agreement. “We don’t have time to wait any longer,” she said. Her drive and her unstinting efforts, with a whirlwind diplomacy plied across the globe, played a major role in galvanising governments. But so did her behind-the-scenes tact and deep understanding – gleaned from those years in the negotiating trenches – of each country’s sensitivities and limits. She listened to the negotiators from each country, and she talked to the leaders. She also invited civil society groups to play a full role, while making clear the dangers of runaway climate change. Figueres will step down from her role on July 1, 2016. She has yet to say what she will do next, though it is likely to have a strong environmental angle. Her successor is also a matter of speculation. Paris is now the world’s legally binding blueprint for tackling climate change. Whether it will stand or fall depends on the changing complexion of governments in key countries, such as the US, China and India. But with the commitments set out in the agreement, and its scientific backing, governments that wish to renege upon it in future will face a difficult task in explaining why. Any international agreement is only as binding as the countries signed up to it wish it to be, so the future of efforts to curb carbon emissions will always be uncertain. But what is certain is that Figueres has been the co-creator, with world governments, of one of the most important global agreements of the century.